“Sabji wala... sabji le lo. Carpets... Sari wali... Vaccum cleaner? We have all heard that insistent voice, demanding our attention, offering a wide variety of goods and services, at one point or another in our lives. Door to door sell is a very common and old sales technique. Small vendors dealing in general day to day stuff to big companies offering all sorts of products; this practice is used by all of them. 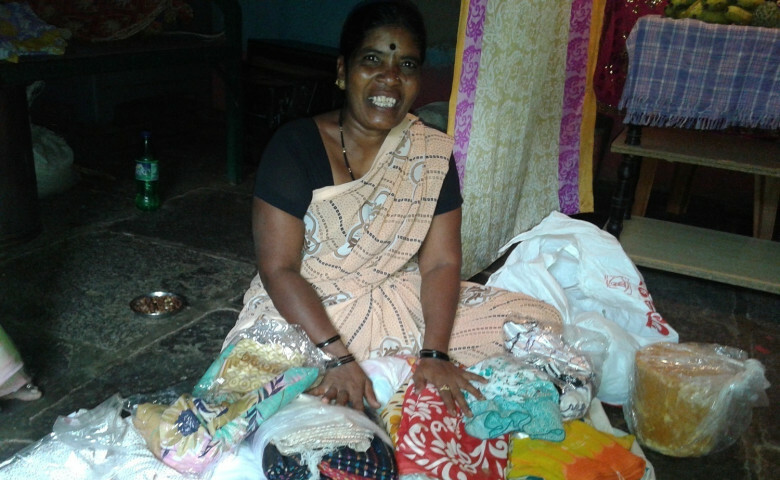 Vachhala Kamble, hailing from Jalalpur village in the Belgaum district of Karnataka, is one such vendor. She is a former Devadasi who became a member of Honavva's group and recently took a Milaap loan to expand her business. I was not able to meet with Honavva, but Vachhala shared everything about her business joyfully. Life has not been easy for Vachhala, but her determination and zeal to do her best was palpable when I first met her. “I used to sell only gur earlier. But now I earn more selling clothes”, she said. She was able to earn a profit of Rs. 5 on 1 kg gur (A solid brown sugar made by boiling sugarcane juice) selling it in weekly markets and nearby villages. After taking the loan, she decided to diversify her business. Now she also sells saris, frocks and other dress materials and makes a profit of Rs. 30 to 50 on each sell. Not only this, Vachhala also works for Shakti AIDS foundation. Being herself familiar with predicaments of socially exploited women, she is trying her best to help others in whatever way possible. Her loan is nearly repaid and now she is looking forward to dedicating all her time to textile business and expand it further.